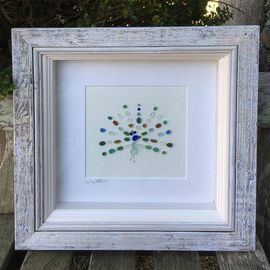 Seabloom Art - Sea Glass, Sea Pottery and Driftwood Wall Art. Nancy Falkow is an American artist and musician now living in Ireland 13 years. Upon moving to Co Wicklow in 2010, she discovered beach combing. It wasn't long before she began creating unique works of art with her palette of soft blues, greens and whites. 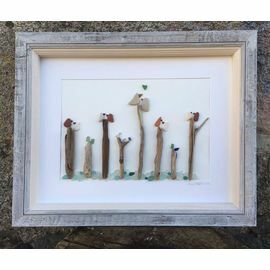 As surf tumbled sea glass, sea pottery and driftwood wash ashore, she uses them (just as they are found) to create art, jewellery and accessories. Each piece is one of a kind, and those found at The Boat Yard Gallery are uniquely and beautifully framed, perfect for any home.